Rob Perrée: Basquiat, the musical? I suppose it was only a matter of time, but yes, Jean-Michel Basquiat is finally poised to take his place in the pantheon of musical theater. It’s almost surprising that it hasn’t happened sooner; Basquiat’s story has all the makings of the perfect drama: a rise from poverty to insane fame, drugs, early death — and he even dated Madonna! According to Broadway World, the new musical “based on the life and times of [the] 80’s [sic] art-star” will have a private reading next Monday, June 24, with Eric LaJuan Summers, who recently won an Astaire Award for his dancing in Motown: The Musical, in the leading role. 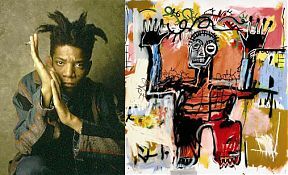 Basquiat the Musical was conceived and is being directed by Paul Stancato, with writing by Chris Blisset (music and lyrics), Matt Uremovich (lyrics), and Larry Tobias (book). Curious to know more about the production, especially whether or not it adheres to the well-known Basquiat story line or tries to dig a little deeper, I emailed Stancato a few questions. “I like to think we are bringing a new angle to it,” he wrote. I wasn’t so much interested in doing a bio-piece on Basquiat as much as I wanted to pose specific questions about celebrity, race, culture, generational gaps and family. Also, the music is really amazing. The composer, Chris Blisset and lyricist, Matt Uremovich, capture the time period and still bring a fresh approach to the music, as opposed to re-writing hits of the time, which I find always fall short. Larry Tobias, my book writer, challenges the audience to see two sides of a world and decide for themselves which choice they would have made if they were in that situation. Life is full of choice, and it is our choices that help define who we are. Learning about who Basquiat was and the scene he was a part of was just inspirational for me. I mean, we’re talking about the last true cultural revolution of our time. The late ’70s-early ’80s East Village New York was a mecca for artists coming together and creating this scene that would eventually take the mainstream by storm and give us what we now consider to be “The ’80s.” Also, rap, break dancing and graffiti was starting to emerge and graffiti artists like Fab 5 Freddy and Lee Quinones were also a part of this scene. It’ll be interesting to see if Stancato and his writers actually succeed in presenting Basquiat in a new light; with two movies already made about him (one fiction and one documentary) and tons of writing, it’s a difficult task to break away from the Basquiat myth. Then again, a lot of people who might go see the Broadway show don’t necessarily know much about Basquiat at all, and there’s a good chance they’ll find his story fascinating. Provided Stancato and his team avoid the fate of Leonardo the Musical (hilariously subtitled “A Portrait of Love”), whose “1993 West End production is considered one of the biggest disasters in the history of London theatre,” according to Wikipedia, they may have a hit on their hands. If Rent is any indication, contemporary musicals about artists can certainly go far.